The Jayshree Periwal Highl School is a place we love to come to and the icing on the cake is when we get to stay here. The best learning takes places amongst students during midnight feasts and pillow fights forging firm friendships for life. The Residential Program at JPHS is a home away from home. The environment is protective and attentive like home and, at the same time, makes children independent enough to grow as individuals in their own right. The world class learning facilities, the delicious and healthy multi cuisine meals, the idyllic surroundings, the air conditioned rooms and friendly staff leaves children feeling secure and happy. 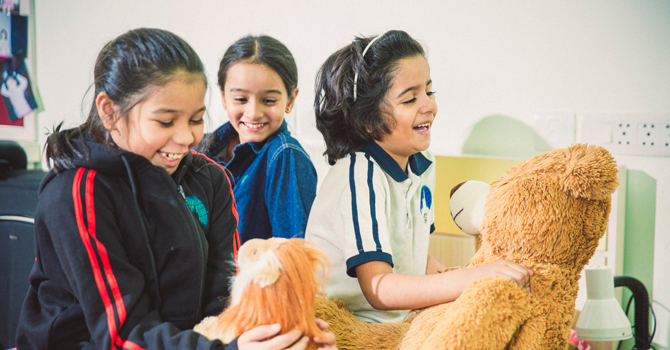 A close-knit atmosphere, combined with the international flavor of students from different countries, makes the school a truly unique learning environment. Personal care and attention is provided to each and every one of us in aspects of a strong foundation of academics, personality development, cultural enrichment, talent / skill development, increasing our intellectual and emotional quotient to getting prepared for a strong career and life ahead. The Boarding house has separate floors for junior, Middle and High School. The environment is Ragging Free and there is a lot of camaraderie between seniors and juniors. Each floor is supervised by an experienced residential House Parent, with Support Staff to cater to individual needs of each child. We, hostellers, have extra classes on Saturdays with subject teachers to ensure that our doubts are cleared effectively and to ensure our academic success in the examinations. In addition, we run a democracy through our Hostel Council thus ensuring that we have a say in the food menu and outings. The residence parents have made a personal commitment to be there for the students beyond the call of duty at any time during day or night. In the absence of parents, the residence parents play an important role in their children's lives of being a protector, shield guide, friend, counselor and a role model to inculcate good habits. Professional personal counseling and medication are available to all students as a means of enhancing personal development and resolving the confusions and conflicts, which may occasionally arise in even the best-regulated community. The Personal and Social Education program includes units on such issues as personal relationships, adolescence, peer pressure, coping with stress etc. A high well secured boundary wall is manned by 24 hour security guards. The hi-tech surveillance system is monitored by Security Officers and the campus is self-supporting and self sufficient in every possible way with its own power back up, water supply and sewer systems. The extensive telecommunications and data network on the campus ensures 24 hours connectivity for the students and faculty. Above all a sense of discipline and responsibility is instilled in each Jpite. Jayshree Periwal High School offers day, weekly and term boarding options to the students. The flexible options provided by the school have been designed keeping in mind the hectic schedule of the working parents. Weekly Boarding: In today's day and age where both parents are working and live in a nuclear family "Weekly boarding" is a useful option. In this option, the students get to stay in the school during the weekdays i.e from Monday till Friday afternoon and report back to school again on Monday morning after spending the weekend at home. The students are involved in all the activities that the school has to offer; at the same time we go home for the weekends and get to spend quality time with the members of our family. This helps us remain closely connected with our parents, siblings, friends and extended family.We are even allowed to stay back in school for special events in case required. Term Boarding: The complete Boarding Option provides various constructive activities for students along with a strong focus on Academics. For Junior and Middle School children, a lot of attention is paid to overall development; to become independent, honing the student's innate talents and laying a strong academic foundation. through supervised study periods after classes. For the Senior school program, the focus moves to paving a path for a future career ahead. Specialized Coaching is offered to students in areas they would like to excel in. From preparing for the Competitive Exams like IIT-JEE, NEET, CLAT, to preparing Design Portfolios for Art school to SAT preparations for going abroad to study, the students are spoilt for choices. The Boarding Program is supplemented with various Adventure, Cultural and Social trips for children to have a sense of the real world. Jaipur is a bustling town with all modern amenities and entertainment so supervised and chaperoned trips are organized fortnightly. Weekend activities, Musical evenings, Bonfire Nights and Talent Shows are also organized which provides us a platform to showcase our talents. One may stay away from home, but one is never far away from fun and celebration. India as a country is known for its many colorful festivals. We bring these festivities to our campus on every given occasion. This creates a home-like atmosphere and does not let anyone feel they have missed out on anything. Education is not the filling of the pail but the lighting of life.